It is said that by reaching the light, self-discovery unfolds it's hidden path. It illuminates, it defines, and it hallmarks the inner workings of one's soul. At Titan Black we have conquered that darkness; pushing the boundaries of not only craftsmanship, but of personal style by introducing fine watch connoisseurs to a new level of individual expression. Leveraging over 50 years of combined watchmaking experience, our expert dial artisans and electronics engineers have transformed the already exquisitely designed and manufactured Rolex Daytona by integrating an innovative Light Delivery System. Controlled by the watch's chronographic buttons, the LDS has the power to transfigure each of the customised watch faces with the radiance of perfectly layered designs, names, or symbols. 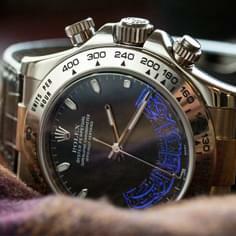 Originally created for the Ruler of Abu Dhabi and President of the UAE Sheikh Khalifa Bin Zayed Al Nahyan, the modified Rolex Daytona features a light enhanced dial that magically illuminates to reveal the owner's name, etched in piercing blue LED script. Luxuriously soft calf leather and hand polished black piano wood were then skilfully combined by our in-house design team to create a custom-crafted box which also features an automated directional winding system. The result is a spellbinding experience which creates an intimate bond between the object and its wearer. Titan Black, inspired by their achievements, now invites its discerning clientele to take the same journey of personal expression with its new bespoke collection of LED enhanced luxury watches. As masters in the art of time piece enhancement, Titan Black specialises in fusing technological innovation with the very best in fine watch making to create statements of inimitable style. 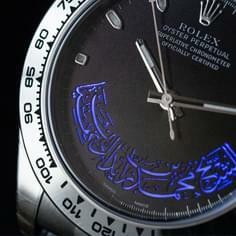 Customisation of a White Gold Rolex Daytona Model Reference 116519. Limited to 01/20 Pieces. 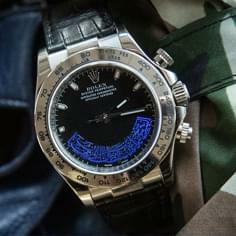 Movement: Rolex Automatic Movement hybrid with Patented CHRONOLIGHT functionally / light delivery system. 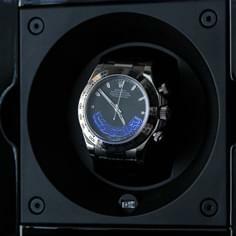 Case: Oyster 40mm White Gold finished in our military grade Black DLC (Diamond Like Carbon). Dial: Custom laser cut 'I LOVE YOU' design. Bracelet: Custom Hand Made Leather Strap. 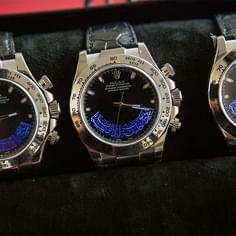 Engraving: Each piece is part of a series and is laser engraved on the case back. 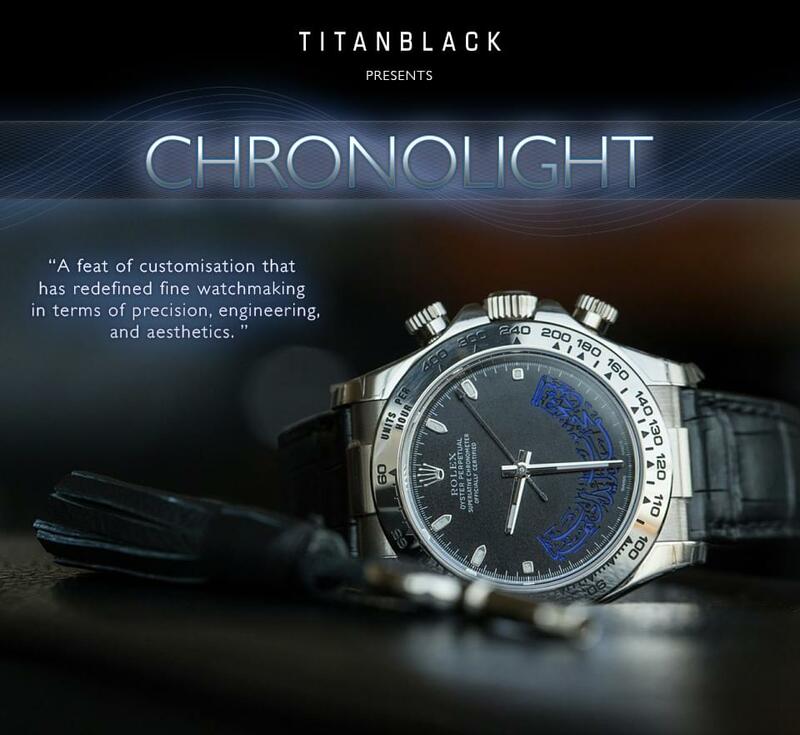 The watch is supplied with a Twenty Four month Titan Black Full Warranty. Case: Oyster 40mm White Gold finished in our military grade Black DLC Diamond Like Carbon). Dial: Custom laser cut 'LIVE YOUR DREAMS' design. Please complete the form with your Chronolight enquiry. Or else call or email us to discuss your Chronolight in more detail.